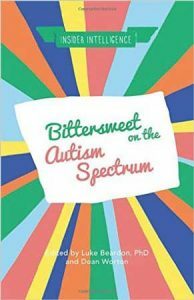 I have just read the second of two books edited by Luke Beardon and Dean Worton which is called Bittersweet on the Autism Spectrum. 28 writers describe positive experiences they have had on the Autism Spectrum and how unexpected things can be a source of positivity. Their insights range from being very moving, honest, sometimes hilarious and very surprising. Luke provides the preface and both Luke and Dean do an introduction to each chapter. I cannot do justice to the whole book as each chapter is varied, interesting and most importantly written from the heart and experiences of individuals on the spectrum. I shall be bringing this book along to the post-diagnostic support group if people would like to borrow it in the usual manner.